No. But it’s possible he’s ‘an’ antichrist. It’s also possible that you are… so don’t jump up and down at me for being too judgmental… yet. There’s a bit of a conversation happening about how useful or not useful Jordan Peterson is for Christians; how much we should be learning from what he says, versus how much we should be learning about his appeal to his audience (an audience we struggle to reach), versus should we simply be condemning him for certain things he says that we interpret in particular ways that often seem removed from his intent. That last one depends on how post-modern literary criticism flies for you, and I’ve got mixed feelings on that one. I think there’s value in ‘feminist readings of Jordan Peterson’ or criticisms from women, and hearing them very carefully and incorporating them into how we might use or apply a text, but I’m less convinced they’re useful in working out how to judge a person behind a text, especially if that person is on the record disputing positions such a reading suggests he holds… the use of ‘reader-response’ critiques is in the context of a conversation, and hopefully such conversations bring about change because people, including the writer, are listening carefully to one another… that’s the ideal. This is why I keep referring to how many women are hearing Jordan Peterson as valid data and as relevant to what I’ve written about his work thus far. There are many people who believe Jordan Peterson is on a journey towards Christian belief (perhaps himself included), and that would be a good thing, there’d be a party in heaven — just like there is when anybody turns to Jesus. I can’t know his heart, or where his journey might end, but I can wonder if he does reach that point, what he’ll then say about some of his writing thus far… and I can comment on that writing in terms of how I perceive its usefulness for Christians; it’s one thing to read a writer to understand his popularity with an audience (especially if it’s an audience that feels disenfranchised by the church), it’s another thing to read a writer critically (to figure out what gold we might plunder, see my second post on Peterson), this piece is for those who might be tempted to uncritically accept Peterson’s writing not so much as Gospel (because I think most Christian readers will recognise that what he says about Jesus isn’t quite right), but as helpful without substantial re-framing. Asking if someone is the antichrist might seem provocative and sensationalist… especially someone who seems to love the word of God so much and to be seriously grappling with who Jesus is, but I want to suggest that’s precisely the type of person the Bible calls an antichrist. In my last post on Peterson I mentioned his ‘subtraction story’ — that he left the church in his youth, and that he now finds himself trying to figure out what to do with the ‘archetypal’ mythic quality of the Jesus story (which he sees as the grand narrative of the Bible). He wants Jesus to be a form of truth, but at this point, since he’s not yet calling himself a Christian, and since he demonstrates a flawed understanding of the Gospel in terms of the death of Jesus being the central act in history that is applied to all of us rather than an archetypal act that we should all participate in by taking up our cross. Here’s Peterson on the other half of the Easter story, the Resurrection… which again he predominantly reads symbolically or archetypally. Here’s a quote from the video. He seems so close. Just jump into faith Dr Peterson. If you watch Peterson, and read Peterson, and find yourself similarly profoundly struck by the Bible’s story and haunted by the metaphysical, then Try Jesus. Today. Now, I mentioned Peterson’s ‘subtraction story’ because it’s a picture of ‘going out from’ the church because of doubts about the core teachings about Christianity (he describes leaving the faith of his youth as seeing the church’s teachings as ‘wishful thinking’, and whether he’s on a trajectory back or not, there are some things in his ‘psychological’ take on Jesus that are essentially explicit denials that Jesus is ‘the‘ Christ; in his system he becomes something like ‘a’ Christ, and we all have to become Christs too. In many ways I think Peterson would be more helpful if he didn’t push a ‘psychological’ or ‘symbolic’ reading of the Gospel… because doing that is dangerous and potentially incredibly destructive and misleading if Jesus really did ‘come in the flesh’ … if he really is ‘the Christ’. That it’s a danger of the type John writes about in pretty strong terms. That it’s ‘the spirit of the antichrist’ to want to re-bake the story of Jesus into something compellingly natural, or merely ‘mythical’ or ‘symbolic’ rather than a case of the supernatural entering and redefining the natural. I want to suggest that a psychological reading, like Peterson posits, without a metaphysical or spiritual reality that Jesus came, died, and was raised, is a teaching that doesn’t ‘acknowledge Jesus has come in the flesh’ that he ‘is from God’ and that he is ‘the Christ’ and so, like anybody who denies that the resurrected Jesus is both human and divine, Peterson, at this point, is an antichrist. It’s clear from this bit of 1 John that the antichrist isn’t one scary mini-Satan with horns and a tail, or one worldly power who sets himself up in opposition to Christ (though John does some fun stuff with ‘beasts’ and Caesar in Revelation). Indeed, anybody who isn’t ‘pro-Christ’, recognising all these categories that John presents, is ‘anti-Christ’… and people who then teach people about Jesus, as antichrists, are particularly dangerous. There’s a hot debate in 1 John scholarship about exactly who John has in mind here… lots of people have suggested it’s people from an early stream of gnosticism, people who believed the physical world was dirty and terrible and God would never have moved from the ‘ideal’ disembodied, spiritual, forms into fleshy reality — that it’s about people denying the incarnation of God (and Peterson’s ‘psychological/mythological’ take of the Jesus story stands in that tradition a little), but I’m more convinced by a thesis advanced by Matthew Jensen. You can read a journal article summarising it here, that John isn’t immediately writing about those who deny the incarnation was real (though his argument would include that), but specifically those who denied the incarnation was followed by a resurrection in the flesh. People happy enough with a human Jesus, who were not convinced that the resurrection was a real one. In the flesh. Not just a symbolic one. Or a spiritual one. But that Jesus remains human and divine, and both a pattern for our resurrection, and the one who secures it. Belief in Jesus according to Jesus, and according to John, is belief in both the physical reality, the mythological or symbolic reality, and the spiritual reality of his life, death, and resurrection. To believe that is to have the Spirit of God. Without this, you’re an antichrist. Any ‘rebirth’ you get through Jesus’ teachings ‘psychologically’ is a finite shadow of an infinitely better reality. You get that rebirth and more when you accept Jesus on his terms. Whoever doesn’t believe in Jesus, on Jesus’ own terms, is an antichrist who is condemned. Strong words. Judgmental words. But belief secures life on God’s terms, re-birth, resurrection, and eternal life through Jesus. Make the jump Jordan. I really hope you’ll get there because you’ve already got such a rich understanding of Jesus — but it can be richer. Cross into belief and then see what that does for life now if there’s something more to Jesus than just the psychological, symbolical, or mythological beauty. You get a better myth, a fuller wisdom, and a richer masculinity. Do it. Jordan Peterson is a wise man. But just how wise he is depends on how much the these claims about wisdom are real. And if they are real; just how much one is prepared to acknowledge that not being as wise as you can be — articulating a wisdom apart from the real ‘fear’ of the Lord — is actually a form of folly. And if it’s folly, then such that if we were to doggedly follow him as a wise man, when some truer wisdom is out there is to adopt an incomplete picture of how to live. And so here, humbly (mostly pointing to the wisdom of others), I’d like to offer some suggestions to those who find the sort of wisdom Peterson offers in his videos, and his books, including his just 12 Rules For Life: An Antidote For Chaos appealing. Peterson’s 12 Rules are strongly built on a foundation that reality occurs along a spectrum of chaos and order; the ‘ying and yang’ of Taoism; that in fact, these ‘forces’ or orientations, held in balance, are at the heart of the cosmos and the human psyche. He personifies chaos as feminine, which he argues is ‘archetypal’ but has rightly frustrated many women (especially because he has so caught the imagination of young men). The first chapter, on lobsters and dominance hierarchies, almost got its own post such is its suggestion that for men to get women to swoon over them, and date them, they need to capture some sort of ‘will to power’ and stand up straight… there was some stuff in that chapter that I felt had the tendency to leave ‘upstanding’, or ‘dominant’ men feeling entitled to be loved, and thus righteously angry at their advances being rejected. Fox makes an interesting subsequent point when it comes to Ma’at’s intricate relationship with Egyptian mythology; that you can’t generalise principles from one mythic theology and generalise across theologies; which is pretty much Peterson’s schtick. I’m not sure I totally buy this, I’m more inclined to be with Lewis in Myth Became Fact (see part one of this series), that all ‘myths’ are in some sense an attempt to articulate an intrinsic ‘mythic’ quality of the human spirit. But what’s interesting is how Ma’at is both the sort of order Peterson speaks about as ‘archetypally’ male, as opposed to the feminine chaotic, that Ma’at is said to be similar to the Hebrew Hokma (wisdom, and a feminine noun), and Greek Sophia (wisdom, and a feminine noun); in Proverbs, wisdom is personified as female (symbolised as a wife to be pursued). All three ancient traditions that have some sort of archetypal ‘order’ personify that order as female. His statements about order and chaos being masculine and feminine almost universally and then his frequent dipping in to Egyptian mythology are a weird and obvious contradiction. In Egypt the personification and deification of Chaos is also a serpent — Apep, and Apep is male. He’s considered the opposite of the female Ma’at. Ma’at, or wisdom, was the antidote to chaos — a properly ordered life — for the faithful reader of the Old Testament, who might dabble in the wisdom of the world, and find truth in a collection of axiomatic statements about reality from foreign sources, this wisdom must be built on the platform of Israel’s knowledge of the creator of that order. While Fox suggests Ma’at didn’t directly influence Hebrew wisdom — specifically the understanding that ‘ma’at’ was the fundamental order of all things — it’s impossible to deny that Egyptian wisdom influences Proverbs when Proverbs explicitly features Egyptian proverbs from the Wisdom of Amenemope. The bits where Proverbs explicitly borrows from — or quotes — foreign wisdom are bracketed with statements like those quoted from Proverbs above — the fear of Yahweh, Israel’s God, the creator of the cosmos, is the beginning of wisdom. Yahweh trumps Ma’at; both in the wisdom stakes and the mythic stakes. But in this borrowing there’s also a model for us thinking about how we might approach Peterson and his (and Jung and Nietzsche’s) mythological approach to wise living. Israel, corporately, both men and women, are God’s ‘son’. Part of the point of the exodus — where Israel crossed the Jordan — was them being declared as God’s children; to be a pattern for, or example of, wise living who were meant to bless their neighbours in part by being wise, so that the nations would see their wise lives and glorify God. In the early chapters of Deuteronomy — another guide to wise living for a ‘son of God’, Israel’s wisdom is to be part of its witness (reading Solomon’s reign, and the Proverbs, against these words is interesting, isn’t it). This is in the same chapter that Moses talks about Israel crossing the Jordan as them entering their inheritance; entering ‘sonship’ so to speak, and there’s a pretty big warning about making idols or images of God because they are his images; and his nation of priests (Exodus 19); they are meant to represent him in the world. Therefore watch yourselves very carefully, so that you do not become corrupt and make for yourselves an idol, an image of any shape, whether formed like a man or a woman, or like any animal on earth or any bird that flies in the air, or like any creature that moves along the ground or any fish in the waters below. And when you look up to the sky and see the sun, the moon and the stars—all the heavenly array—do not be enticed into bowing down to them and worshiping things the Lord your God has apportioned to all the nations under heaven. But as for you, the Lord took you and brought you out of the iron-smelting furnace, out of Egypt, to be the people of his inheritance, as you now are. To ‘cross the Jordan’ is to become a son of God; whether you’re male or female (there’s an interesting implication of the command not to represent God as a man or a woman, which fascinates me because of how in Genesis 1 God (plural) makes humanity in his image as ‘male and female’… and yet dynamically personifies all his people as his ‘son’; now, Jordan Peterson would see this as supporting his archetypal view of chaos and order being masculine and feminine, but I’m going to suggest Biblical archetypes work in a different way (and sometimes Peterson seems to get this, he does have a nice ‘narrative’ reading of the whole Bible going for him). Here’s a little interlude; a short tangent if you will, about why playing genders off against each other (though with an acknowledged mutual need for one another mostly for some biological imperative) is a common worldly idea but something the Bible fundamentally undermines. I like that Jordan Peterson acknowledges some fundamental differences, biologically, physically, and in how those differences might shape different behaviour, but I don’t like how his ‘dominance hierarchy’ stuff essentially justifies a certain sort of ‘noble patriarchy’ rather than a radical co-operation-in-difference. It seems to me that his basic rendering of the biological universe and its application to human behaviour basically doesn’t just leave men as lobsters competing for status so they can claim the best mate (and be attracted to them), but also leaves us men like peacocks in a perpetual game of charming our mate — or making our desires and demands that we believe might be ‘dark’ and so hesitate to raise them, clear and open, with the expectation that our significant other will embrace them (that was perhaps the creepiest bit in the book) rather than operating in partnership with a radical sort of commitment to elevating and celebrating the other. The heart of Peterson’s model for relationships in his order/chaos paradigm is the ‘masculine’ quality of assertiveness; of making one’s will known, standing up straight, and claiming it (or at least living as though you are entitled to your will), this is pictured as a proud and dominant lobster rising as high up a ‘dominance hierarchy’ as you can. It’s a terrible model for relationships between men and women — and it runs counter to the Biblical picture of wisdom as a woman, and the advice both to Israel (as God’s son) and Israelite sons, to pursue (and presumably listen to and value) a wise partner. The problem in Genesis 3 wasn’t that Adam listened to his wife, but that she gave foolish advice (and so the ‘harlot’ or foolish woman in Proverbs is also a woman, so too the nations whose gods and women pull Israel away from Yahweh. Individualism and this sort of ‘will to power’ doesn’t work in marriage if it’s true that ‘the two become one flesh’. I’d say what gets extrapolated from how men and women relate together from Peterson’s biological account against the Biblical account is a fundamentally different ordering of society. One of the best articles I read last year was by Brendon Benz, titled ‘The Ethics of the Fall: Restoring the Divine Image through the Pursuit of Biblical Wisdom’, he makes a fantastic case for us to reconsider how we understand the dynamic of the image of God being ‘male and female’ such that a purely individualistic view of being human doesn’t work theologically. Here’s a long quote because it provides a thoroughly different ‘archetypal lens’ for reading the Bible as an organising ‘myth’ to the Jungian individualism Peterson advocates (a Jungian ‘plurality’ would be extra fun though). I won’t drag this out but there’s long been a connection drawn between the idea of the image of God (in the Ancient Near East) being a claim to sonship, usually by kings, so in Israel you get this broadened to include men and women (Genesis 1) and then every Israelite (Exodus 4). When Israel crossed the Jordan on their way into the promised land they plundered Egypt; stealing its literal gold. This gold was then used to create both the golden calf (idolatrous and destructive folly) and the furnishings of the tabernacle (part of Israel’s worship of God as creator and provider of the good and abundantly fruitful life in the land). Crossing the Jordan was Israel’s path into nationhood — sonship even — and what they did with gold ultimately revealed what sort of child they were; at certain points they were wise and they flourished (and the nations flocked in to hear Solomon’s wisdom), but at other points they borrowed not just the gold of Egypt, but their gods as well. They were more likely to jump on board with the idea of Ma’at, than fear Yahweh. Which is exactly what we learn in the figure of Solomon. Solomon has an interesting relationship with Egypt, with Proverbs, and with gold. In the account of his reign in 1 Kings we get the sense that he has a fraught relationship with Egypt; that it’s a significant country in terms of his life. 1 Kings wants to make real sure we know Solomon doesn’t end well; he doesn’t pursue the sort of wisdom he started out asking for; and so Proverbs becomes a sort of deeply ironic book attributed to him. Solomon is this positive figure for about ten minutes; and then he’s a picture of disorder and folly; and somehow the Proverbs reflect that high point before his fall. Solomon is described as being somebody in command of the natural world such that he is able to understand and document its order — and you get a sense from the narrative he was also engaging with the sages and wise men of the nations… he was also quick to have his head turned by women he should not have been pursuing, and because he was at the top of the ‘dominance hierarchy’ taking what he should not have taken; the picture in Proverbs of the wise advice from the king (Solomon) to his son to pursue a wife of noble character; the personification of wisdom, is deeply ironic against Solomon’s life and approach — but even more so against Israel’s approach to wisdom. What’s also archetypal here, against Peterson’s system, and as mentioned above is that wisdom or order is feminine, and perhaps the brashness of masculinity needs to be tempered by a listening partnership with wisdom rather than embracing destructive folly; the gendered stuff Peterson does is inverted in the Proverbs… but the warning from Solomon’s life, and Proverbs, in history is that if you’re going to plunder gold from Egypt you better be sure not to use it to build idols, or have it pull you away from the truth about the God you should be fearing. Incidentally, later, and probably without having discovered the strong links between Proverbs and Egyptian wisdom, Augustine took the idea of plundering gold and explicitly applied it to what the Proverbs implicitly practiced — the idea that truths expressed by people in the world about the fundamental order of creation should be taken and used to their proper ‘ordering’ — their telos — which he saw as ‘to preach Christ’ (if all this stuff fascinates you, it is what I wrote my thesis on; the (short version of the) title is Plundering Gold from Egypt to Contextually Communicate the Gospel of Jesus, and it includes a big chunk on Proverbs and wisdom, and how to ‘plunder Gold’ appropriately. The book of Proverbs, like Jordan Peterson, appears to teach men to be men, but is really a guide for all people to re-order or re-cast their lives against a background of chaos. There’s lots of ‘truth’ in what Peterson writes. But here’s the thing — the ‘mythic frame’ — the ‘story’ that wisdom is delivered in matters. Especially when that wisdom is a sort of axiomatic description of an ‘ordered life’ and where it explicitly speaks as though myth matters. It’s much harder to purely plunder Egypt, without straight up importing idols, if we’re careless about the mythic frame and the vision of masculinity (in this case) being put around those ideas, and that’s where Jordan Peterson is perhaps more dangerous than we think. There have been some worthwhile reflections on Peterson’s picture of masculinity offering Jesus as a corrective to his vision; or rather a corrected vision of Jesus (and the cosmos) as a better antidote to chaos. But I’m not sure how possible it is just to tweak his picture around the edges. Plundering Peterson might require an almost total meltdown of his rendering of Jesus and the cross and a total recasting of his vision for humanity. It’s interesting to consider how ‘crossing the Jordan’ works as a Biblical archetype ultimately found in Jesus, and how this might invite us to cross Jordan Peterson, and understand the Cross as something more than taking responsibility and trying to save both yourself and the world… what if our real humanity is actually found in the mystery of union with Christ; that somehow our sonship is about dynamically being ‘one with him’ though still many. Jesus is recognised as God’s son, our image of humanity, our image of image bearing, is recast in him (a theme picked up throughout the New Testament). In Jesus God becomes our father. We become his sons — whether we’re male or female, but this ‘sonship’ requires a dynamic, image bearing relationship of listening to the other and not simply being individuals with a will to power — because real wisdom is not found in dominance, but submission. Our crossing the Jordan — our exodus — our baptism — is a baptism ‘into Jesus’; a receiving of God’s Spirit to make us one with him (so individualism is tricky to maintain as a sort of exclusive picture for flourishing humanity). Jordan Peterson is a wise man offering a reasonable version of Egyptian wisdom (except he should invert the genders of order and chaos). He offers a reasonable ‘Egyptian’ attempt to plunder the gold of true Israel. But until he understands the world inverting foolishness of the cross, until he fears God, I’m not sure it’s wisdom at all, and I’m pretty skeptical of claims about his usefulness for the church without some serious re-framing and melting down of whatever gold it is he offers so that it can be used in service of the creator. Real wisdom is not found in power but the fear of the Lord and the subversive wisdom of the Cross. You want to see how the crucified Jesus is archetypal? Look at Paul. His teachings and his life. I’ll flesh this out (in an almost literal sense) in the next post, but here’s what he says about the wisdom of the world and how it is confounded by the cross not just subtly tweaked… this is what really ‘fearing God’ looks like — seeing human strength and dominance as foolishness in the face of God’s power and his operations in the world. Jordan Peterson’s 12 Rules For Life: An Antidote For Chaos is going gangbusters in Australia; and he’s speaking to a sold-out auditorium here in Brisbane tomorrow evening, so I’ve been ploughing through his work (including the book) and trying to figure out what makes him resonate so strongly with Aussie blokes (perhaps especially with Christians). This is the first of (at least two) posts interacting with Peterson’s book. One thing I’ve appreciated about Peterson is that because he’s into Jungian psychology he stresses the importance of story, and particularly because he’s a champion of the west (and western individualism) the particular formative importance of the Christian story; or at least his version of the Christian story as the ultimate human archetypal narrative that teaches us most of what we need to know to live a good (western individualistic) life. He’s been particularly popular among western blokes and his no-nonsense appeal to take responsibility stands in a certain sort of tradition of addressing wisdom to blokes — one we find in the Bible; only, there are some problems with the scope of his ‘wisdom’ (and where it begins) that mean there’s a strong possibility his advice will end up being bad for anybody other than the ‘strong’ — who end up being those the western world privileges — which, already, by most measures of ‘success’ or ‘goodness’ are people just like him (and me), the very people lapping up his vision for the good life, the ‘winners’ in the western world. White blokes. Particularly educated and able white blokes. I’ll dig into this in the subsequent post on his treatment of order and chaos as masculine and feminine, but it’s worth reading this review from Megan Powell Du Toit to hear how he is heard by wise women. There’s something to him and his serious engagement with the story of the Bible that makes you wonder if maybe we’re witnessing a long and public conversion; perhaps if YouTube had been around while C.S Lewis was writing and publishing in the lead-up to his conversion it might have felt the same. What is particularly interesting is what Peterson does with Christianity — with the story of the Bible. Part of Peterson’s appeal is that he offers some pushback to a (secular) movement in the west that is aiming to level the playing field for non-white-men, that some blokes feel dehumanised or demonised by; part of his pushback is the idea that the good things about the west are a product of its Christian heritage, that not all white men are terrible, and in many ways the way the story of Christianity changed the way the white blokes from the pre-western world slowly started to include others in their thinking about how the world should be won (we’ve got to remember that Julius Caesar was an ‘archetypal’ white bloke, and the world would look very different now if it was shaped more profoundly by Caesar than by Jesus (who was a bloke, but not white)). There’s nothing inherently wrong with being a bloke; with being white; or with being born into privilege historically, globally, and economically. The question is what to do with privilege or power… and here’s where Peterson dallies with some dangerous ideas, and where his incomplete picture of the Bible might cause us to come unstuck. It’s also worth remembering that while there’s a bunch of white blokes — perhaps especially in America, and perhaps those whose imaginations were most captured by the Trump campaign — who feel like victims in a bold new world. These blokes also often sense that the main people causing their victimhood — the oppressors — are the ‘left’, those seeking systemic change to elevate women, people of colour, and other minorities to the positions in society often held by white blokes in a way that sometimes feels demonising in the rhetoric around the role white blokes have played in shaping this world; and sometimes, frankly, is demonising… And, amidst this remembering, it’s perhaps worth reminding these white blokes (and all of us) that it’s not really the left taking away jobs and keeping the white man feeling down, and angry, it’s the powerful and the wealthy who sit atop what Peterson would call a dominance hierarchy. You want to talk about job losses for the working class? 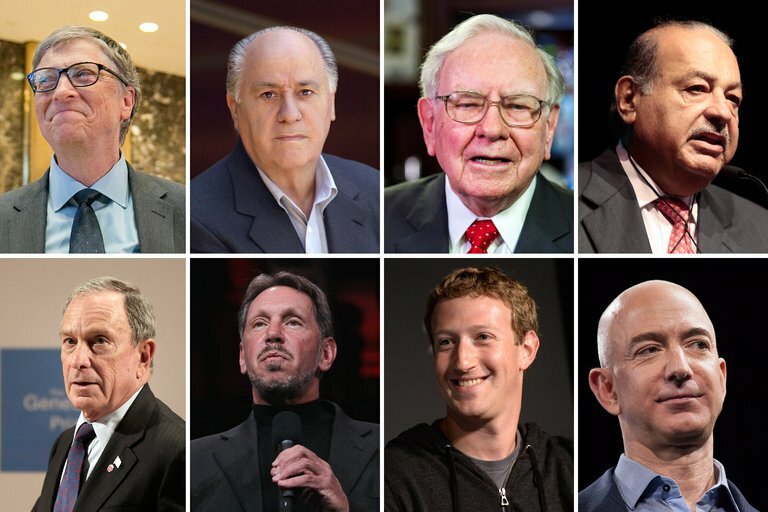 Talk about the people behind the tech companies that are innovating and automatic manual labour; talk about the people taking the lion’s share of company profits through bonuses and off the back of the work of others… talk about these eight blokes whose combined wealth is greater than the combined wealth of 50% of the planet. That’s obscene; and how can it not be oppressive? To the extent that Peterson does offer a solution for men emasculated by a culture of dominance — by dominance hierarchies that we, as individuals rather than a class, are not on top of — is to invite the individual to redefine the parameters they measure success by; and to take responsibility for their own lives — to commit to making the world more like heaven than hell — which isn’t, in itself, terrible advice. His antidote to the chaotic dissolution of community life is for individuals to take responsibility for themselves; which seems counter-intuitive, but is advice I’ve found a particular balancing corrective to my growing frustration with our whole-scale adoption of western individualism in the church, as Chesterton wrote in Orthodoxy, Christianity is a collection of furious opposites; a robust Christianity “got over the difficulty of combining furious opposites, by keeping them both, and keeping them both furious”; paradox is at the heart of wise negotiation of the world we live in, and it is certainly true that we are both individually responsible creatures, and social creatures who are embedded in identity-defining communities built on shared stories (be it the family, the tribe, the nation, the workplace, the church, etc). Peterson is big on the power of stories, but he emphasises the idea that to be fully realised as a person, one must embrace the ‘heroic path’. There’s a strong hint of Joseph Campbell’s Hero’s Journey under the hood here — Campbell was an expert on ‘myths’ and the way we organise our lives, and sense of the good life, through stories rather than facts; and especially through archetypal heroes, or ‘super men’. This message — and some of Peterson’s schtick — has resonated particularly with men. And you can see why a bit; but it is a message of only limited use. The “burden of being” is the fundamental reality of suffering; it was this reality, Peterson said, that caused him to leave the faith of his childhood (though it seems he has returned to the mythic stories of his childhood to continue making sense of the world). This is chaos. This is what must be mastered. This is the issue he tackles. While he might doubt God, he is sure of one thing… the reality of suffering and the particular capacity for evil lurking in every human heart and emerging at various points in history, and the lives of individuals. Peterson’s view of the human condition is — in Taylor’s diagnosis — ‘buffered’ — there is no cosmic problem external to ourselves; so we can save ourselves. Evil is not ‘out there’ but in here. The problem with the world is, as Chesterton put it, the individual. It’s you. It’s me. Or, as he says when unpacking the Bible’s account of evil as an archetypal story, from Genesis 3… there’s no external, supernatural force, no Satan; the serpent is, for him, a projection from within the self (echoed by many selves). A quibbling detail — that the serpent is Satan was made pretty explicit in John’s apocalypse, the book of the Bible we call Revelation; and one that suggests that actually, behind all human evil there is a puppeteer — a serpent; tempting and pulling us towards evil. John invites us to see reality as something more like a cosmic, supernatural, battle ground than our secular age ‘buffered selves’ can envisage… You can’t simply hold on to the words of the Bible as secular myth. It evades such neat categorisation. Yes, there is darkness in every human heart, but to view the human heart as ‘buffered’ — to see us simply as individuals locked in a battle with the self, rather than as people picking sides in a cosmic battle between good and evil misses the mythic heart of the Bible’s claims about the world and us. The mythos of the Bible; it’s organising principle, is that Jesus came to triumph over the darkness of sin, death, and Satan. But if the problem is just us, if the world is closed to the supernatural, and the natural is all there is, these stories might work the way Peterson suggests, and, in a limited sense, we can start fixing and redeeming the world bit by bit, life by life, as we set our gaze just a little bit higher. His 12 Rules are aimed at addressing this problem. They’re derived from a particular moral outlook, a particular picture of how the individual might bring order out of the chaos in the individual heart; there’s a reason his book is categorised as ‘self-help’, because it is that in the most fundamental and literal sense of the genre. His solution is help yourself. For Peterson the cross is an archetype of the sort of life that might produce this change… it’s strangely, for him, the ultimate natural heroic story. It gives us a pattern for making atonement for ourselves and the evil within; for a wise life; for fighting back against chaos and darkness. Peterson calls people to take up their cross to make atonement for your own contribution to the problems of the world. He wants Jesus to be our archetype for the good human life; not our saviour or the one who makes atonement for us. He offers a certain sort of salvation by works… but a salvation not so much looking to an afterlife; but designed to bring ‘heaven on earth’. This is Peterson’s picture of how to be a man. A human. But is it possible? Does it change anything substantial about the world we live in where very strong men rule by dominating and perpetrating evil? What change would it bring to any of those eight men and how they use or view their wealth and their work (which they’d all describe as bringing a certain sort of order)? Does it actually work to deal with the darkness in our hearts this way? Can Peterson’s mythic Jesus save us from ourselves? Peterson champions individual responsibility in the face of suffering, and something very much like Nietsche’s will to power and he really, really, tries to understand the cross of Jesus and its place in the ‘archetypal story’ of the ‘archetypal’ hero of the west; the one man, or character, who truly carried the burden of the being. I want to be as positive and charitable to him though, because I think he’s genuinely searching for a way of life in this world that makes the best sense; of the data, and of how we’re wired (and the stories — myths — we tell generation after generation to encode a certain sort of participation in the world). He quotes Romans ‘you’ve fallen short of the glory of God’, but misses the mark on the solution Romans offers for this… The problem is, without supernatural intervention, or something shining light into our hearts of darkness, we can’t make the changes Peterson calls us to. Sure, our hearts still know what light looks like, but the Bible says we’re slaves to darkness, not just capable of it. In Romans 7, the apostle Paul describes the human life – the human heart — the life following Adam and Eve — in ways Solzhenitsyn and Peterson might recognise from their experiences of reality, but is more pessimistic about our ability to make atonement for ourselves. “For I have the desire to do what is good, but I cannot carry it out. For I do not do the good I want to do, but the evil I do not want to do—this I keep on doing. Now if I do what I do not want to do, it is no longer I who do it, but it is sin living in me that does it. What liberates his heart is not self-help; not an axiomatic pursuit of heaven on earth, but God’s intervention, by the Spirit, delivered as a result of turning to Jesus and sharing in his death and resurrection. This is Paul bearing the ‘weight of being’ — suffering, taking up his cross, not just to improve life in some temporary sense, but because our lives have eternal significance. You can’t extract a temporally significant ‘mythos’ from Paul’s writings without making him a crazy man. His life — suffering as he carries his cross — is built on the hope not just of some sort of ‘heaven on earth’ — but because any taste of heaven on earth is a picture of the real and supernatural future won by Jesus. If Jesus wasn’t raised from the dead, Paul says we should eat, drink, and be merry (1 Corinthians 15:32)— there’s no point not inflicting suffering on others if there is no supernatural judgment for that evil. And any decision to suffer, to ‘bear the weight of being’ by imitating Jesus is only really possible and meaningful if Jesus’ victory over death and satan is for reals. For John, and for Paul, the writers of chunks of the Biblical text that Jordan Peterson appreciates so much — the imitation of Jesus actually has to be based on the real victory of Jesus over the burden of being — the defeat of evil, Satan, and death. But John and Paul both offer a picture of masculinity redeemed by the example of Jesus — a life of sacrificial love; bearing one’s cross to improve the lot of others and to fight against Satan by imitating Jesus… it’s just there’s something more on offer than a good or meaningful life now. In Peterson’s mythic take on the Bible and its account for life in this world, we’re either archetypally on team Satan, or team Jesus; there’s no middle ground. The heroic life is the life imitating Jesus; and making atonement by sorting ourselves out. As we live we’re either bringing heaven or hell. The Bible’s mythic idea that helps us understand the stories we participate in as people is also that you’re either team Serpent or team Jesus But fundamental to any victorious or heroic life in the Bible — and the reason to take up one’s cross — is that Jesus destroyed the serpent so we don’t have to, and our nature is liberated by participating in the life of God as his Spirit dwells in us — because we have been atoned, or literally ‘made at-one’ with God such that our lives reflect the lives we were made to live in the world; to be able to begin putting the world right our hearts must first be changed from above. There’s nothing more mythic in the Bible than the vision of life in this world offered by John in the book of Revelation; there be dragons. The same bit of John’s ‘apocalypse’ — literally his revelation about how the world really is — tells the story of the end for Satan, and those humans who follow his archetypal way of life (and so become beastly rather than human). We don’t defeat evil; God does. To try to extract some mythic ideals from the Bible that somehow we must take responsibility for our own redemption, atonement, and restoration, apart from divine intervention just doesn’t work; you can’t secularise the message of the Bible without turning it into superstitious nonsense. A buffered — but haunted — view of the Bible or an ‘enchanted’ true myth? But what if is more than just a human product? What if there’s more to the world than just natural accounts for the nature of being? It seems the jury might actually still be out on this question for Peterson, and we might be getting, in 12 Rules something more like provisional findings on the basis of how he currently understands the richness of the text. He is truly blown away by the richness of the Biblical story; it’s wonderful to see him treat the Bible with seriousness and a certain sort of respect; though it’s ultimately a respect for a sophisticated human reflection on human nature (though haunted by the idea there might be something more to it). In this video he says some pretty profound things about the nature of the Bible. “Everything would be much easier if you would free your thought from this vestigial mythology.” To be sure: far easier. Life would be far easier for the mother of an invalid child if she put it into an institution and adopted someone else’s healthy baby instead. Life would be far easier to many a man if he abandoned the woman he has actually fallen in love with and married someone else because she is more suitable. A man who disbelieved the Christian story as fact but continually fed on it as myth would, perhaps, be more spiritually alive than one who assented and did not think much about it. And this, I think, explains the phenomenon that for me, at least, Peterson (who sees a unifying narrative of redemption in the Bible centred on the cross) is a much more compelling (and useful) reader and commentator on Genesis than people who want to make Genesis do science. But he’s missing something vital. The key for Lewis, as it was for Chesterton, is embracing truths that appear to be furious opposites — embracing the truth that Christianity is both myth and fact. For Christianity to work mythically to offer redemption it has to be true. For it to give us a pattern of life not just for masculinity but our humanity, a pattern that would change and challenge even the wealthiest, most dominant, man (and the patriarchy) in such a way that it could truly bring a taste of heaven on earth, Jesus has to not simply be an archetype, but a real figure; a case where the supernatural world broke in to the natural, to deal with a real cosmic enemy and to substantially change our hearts, bringing light into darkness. Which is exactly how C.S Lewis came to understand the story — from a deep appreciation of myth, and here’s hoping this happens to Peterson and his fans too. The heart of Christianity is a myth which is also a fact. The old myth of the dying god, without ceasing to be myth, comes down from the heaven of legend and imagination to the earth of history. It happens-at a particular date, in a particular place, followed by definable historical consequences. We pass from a Balder or an Osiris, dying nobody knows when or where, to a historical person crucified (it is all in order) under Pontius Pilate. By becoming fact it does not cease to be myth: that is the miracle. I suspect that men have sometimes derived more spiritual sustenance from myths they did not believe than from the religion they professed. To be truly Christian we must both assent to the historical fact and also receive the myth (fact though it has become) with the same imaginative embrace which we accord to all myths. The one is hardly more necessary than the other.